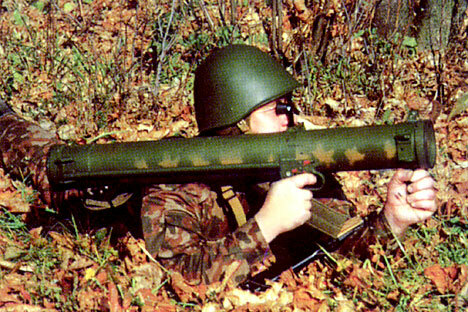 Exactly 30 years ago Soviet forces in Afghanistan received the first models of the latest Shmel ("Bumblebee") infantry flamethrower for testing. Firing fuel-air explosive rounds, the effect of the man-portable launcher was often as devastating as a 150 mm heavy artillery shell, and quickly earned it a nickname drawn from Islamic mythology: “Shaitan’s (the Devil’s) pipe”. Now a vital weapon in the arsenal of any modern army, the rocket-propelled flame thrower was originally developed by due to the need for more effective fire power against an enemy entrenched in fortified positions, houses, caves and other solid cover. The classic backpack jet flame throwers used for this purpose since World War I were ineffective at long range, their stream of fire usually extending only 40 meters and being susceptible to wind strength and direction. U.S. designers found the solution in the late 1960s during the Vietnam War testing of the quadruple-barrelled XM-191 rocket-propelled grenade launcher, which fired 66 mm incendiary shells. The Soviet Union soon fielded its own version in the form of the Lynx rocket-propelled infantry flame-thrower. Effective and accurate over 200 meters, these first successful test units excluded the need for the operator to get close to enemy fortifications, ushering in a new era in the history of flamethrowers. The Shmel then outclassed its predecessors by firing a thermobaric warhead in addition to the incendiary shell: The initial blast disperses a spray of liquid explosive which is then ignited with a special detonator. Forming a pocket of a high pressure over 80 cubic meters, the resultant fuel-air explosion is devastating against an enemy located in shelters. Even before the fuel-air detonation, the initial explosion envelopes the target without penetrating defensive walls. This instantly creates a temperature of 2000 degrees Celsius over the whole impact area, reducing survival chances almost to zero, while enemy forces positioned further from the epicentre will suffer concussion and compression injuries. After the Shmel officially went into service in 1988, mass-produced units also used shells incorporating a shaped charge capable of penetrating light armored vehicles, brick or concrete walls. These punch a hole through which the main charge then obliterates everything inside. But even with its superior specifications, the weapon is technically simple to produce and costs little more than a conventional 150 mm artillery shell. Widely used in numerous wars and localized conflicts, the Shmel has seen extensive service as “pocket artillery” for infantry in urban warfare, where opposing forces are often fighting in close proximity. During the storming of Grozny in 2000, advancing federal troops frequently found themselves occupying one building, with Chechen rebels dug in directly across the street in another. This rendered use of aircraft and artillery too risky and liable to cause casualties from friendly fire. With armored vehicles also too vulnerable to rockets in the narrow city streets, the Shmel was the most effective means of tackling enemies hunkered down in apartment blocks, basements and attics. “We could not suppress the Chechens’ firing positions,” recalled an interior ministry officer who participated in the battle for Grozny. “They had knocked firing slits in the walls of a two-story brick building and were firing with PKMs [machine-guns] and AKs [Kalashnikov rifles]. Not even the snipers could get them. Then our guys brought up a Shmel and put a shell through one of the windows. The house crumbled before our eyes. " Soviet and Russian troops who used the weapon in Afghanistan or Chechnya often talk about how a thermobaric shell blast inside a one-story stone house literally throws off the entire roof. A direct hit on a light armored vehicle or personnel carrier is also guaranteed to knock it out. Today the Shmel is still in service with the Russian Army. And as its nickname suggests, the ‘devil’s pipe’ is to some extent a psychological weapon too, terrifying the enemy with a sense of constant vulnerability and an inability to hide from the hell it unleashes on the battlefield.